Ever wonder why Hollywood churns out so many crappy movies? David Mamet knows the answer, and in Speed-the-Plow, which kicks off a Mamet festival at Actors Theatre, he reveals all. Sort of. Mamet ought to have plenty of insight on this subject. After all, while he made his bones in the theater with landmark dramatic works such as Glengarry Glen Ross, he scored the big bucks by writing screenplays for films ranging from The Postman Always Rings Twice and State and Main to Hannibal and Heist. In Speed-the-Plow, Mamet gives us all of Tinseltown compressed into one room: the new office of Bobby Gould, the freshly minted head of production at a big film studio. 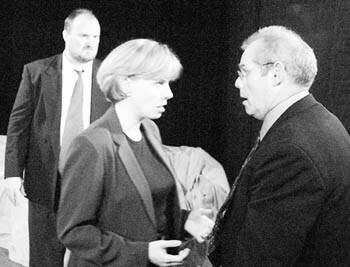 The promotion has put Bobby (played by Joe Winkler) in a position of power, but he's been around long enough to know that it also makes him a target. And sure enough, before you can say "I'm ready for my close up, Mr. DeMille," Bobby finds himself at the center of a peculiar battle of wills between two of his underlings. Think back to those old Heathcliff cartoons, where an angel and a devil whisper conflicting advice into the titular feline's ear. Bobby's shoulders are just as crowded. On his right, pitchfork gripped firmly in a hammy fist, sits the production boss' right-hand man, a hard-charging Hollywood insider named Charlie Fox (Robert Conard). Wearing the angel costume is Bobby's idealistic new secretary, an attractive young temp named Karen (Heather Siglin). The fight is over which script the studio will next produce. Charlie wants to make "great big jolly shitloads of money" with a prison movie featuring action superstar Dougie Brown. Karen, who appeals to both Bobby's conscience and his eye for beauty, wants to save the world with The Bridge, a script by a highbrow novelist that would, as she says, "teach people they don't need to be afraid." The AT production of this morality play offers an excellent cast. Winkler and Conard are big, very physical guys with hugely expressive faces and voices--perfect for a Mamet play. Both actors also have a flair for the kind of macho comic dialogue that pervades Speed-the-Plow. Pondering how Bobby should decorate his new office, Charlie offers this advice: "Why don't you paint it with broken capillaries, decorate it like the inside of your nose?" Heather Siglin brings the necessary physical beauty to the play, but unlike actresses sometimes chosen for this part, she also achieves the potent mix of intelligence and naiveté crucial to making her appeal to the cynical Bobby believable. Confronted by her sincerity and simple questions ("Why must it all be garbage? "), the two men are often reduced to babble. And Siglin even manages to make a halfway compelling case for the quality of the play her character has chosen to champion--which is no easy task. For Mamet has certainly stacked the deck in this contest between conscience and commerce, as might be expected from a Hollywood insider. Are there good scripts the movie biz will never touch because they don't feature enough quivering bosoms, raging gun battles, and thinly disguised racism? Sure, but The Bridge ain't one of 'em. Charlie has great fun giving comic readings of lines like "He thought of architecture." And, really, the script sounds no better than his prison movie. Speed-the-Plow also bears the Mamet trademarks: a raging case of sexism and a lot of irritatingly repetitive dialogue: "This morning a man came to see me." "A man came to see you?" and so on. But it's generally a funny play with a compelling conflict, and the cast assembled by director Brian Newberg manage to wring nearly every drop of comic juice to be found in the script. Just leave your sensitive side at home. 'Speed-the-Plow' continues through Feb. 2 at Actors Theatre, LBC, 50 Mark West Springs Road, Santa Rosa. For details, call 707.523.4185. From the January 10-16, 2002 issue of the North Bay Bohemian.